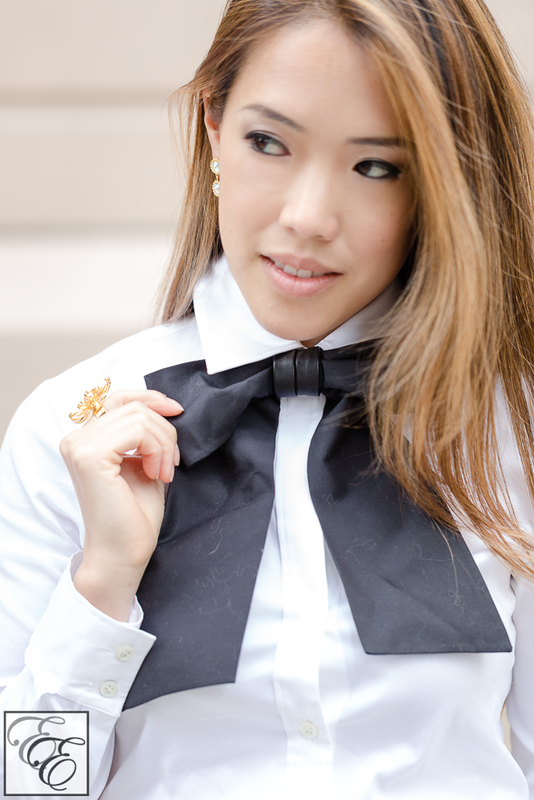 One of my top loves this season is the little black neck bow. A simple, flowing black tie bow topping a crisp white shirt is an impeccably dressy, classy touch. Wearing this Karl Lagerfeld bow, I feel like I can channel the same supreme sophistication that he does. It’s well-made, of stretchy cotton and leather, and has the added comfort benefit of an adjustable snap closure. Warm and snug with the buttoned-up jacket! I built the outfit around the bow, choosing to anchor it with a classic white shirt by Theory and a smart, cropped military jacket. To keep things from feeling too heavy, and to make it holiday-appropriate, I literally lightened things up with a gauzy skirt with a subtle gold shimmer, minimalist gold sandals, and a soft gold leather purse. My investment bag philosophy: find something that is classic, yet undeniably stand-out and precious to you. This is one of those outfits I truly wish I could wear everyday. Touches like the neck bow and gold accents really make this outfit feel special; the compliments I received as we were shooting were great validation! Happy holidays, and have fun creating your holiday look! What are you most looking forward to wearing this holiday season?